I grew up in New York City, Brooklyn to be exact. I suppose because of my upbringing I’ve developed certain traits that clearly make me a New Yorker, but I’ve made it my goal to not be what a stereotypical New Yorker is. Experiencing the city around my immediate environment and Manhattan of course, the stimulus needed for my work to begin taking shape was ever present. Music, people, places, all of this and more inspire where I’ve been and am going. This is also reflected in my characters and their struggles or triumphs within their respective worlds. It’s time to adjust storytelling. Support my work to help start a new and long-lasting reader/ writer trend. Time. I wasn’t born into wealth and, truth be told, was never great with money anyway. As I am beginning to embrace more writing and planning so I can achieve my goals, I’m still on a steady full-time job so I can save up as much as I can, help the family, etc. If I could quit my job and focus solely on writing I would, but realistically, I’ve too much responsibility. With that comes the struggle of finding time to actually write. Getting home later from work and the gym, wanting to rest and have my own personal time, just life outside of pen and paper. Another writer might quickly say that’s just an excuse, but I’m finding my groove and what works for me. Nothing beats my bed. I can visit a library, sit outside somewhere or even at work, but I can’t find “it” except at home in my bed. Screw everything else, haha. The inspiration to write. If I’m not feeling it on a day, week, month, etc. then I won’t write. I refuse to force anything because then I compromise the dignity of the characters and story. Just because someone somewhere has dictated you should write everyday “if you’re a true writer” doesn’t mean it’s the be all, end all rule. I’ll sit on it, think, come up with more and when I feel that inspiration then I go in for the kill. Also silence. If I have a TV on or even music, I won’t get as much done. I need to dive into my world and tell you about it without distraction. The ones that have stuck in my mind are 1984 by George Orwell, A Canticle for Leibowitz by Walter Miller, Jr. and The Golden Compass trilogy by Philip Pullman. As far as recent works, Shane Stadler has a great series titled Exoskeleton parts I and II. Fantasy and science fiction are very strong here but I read a lot of genres in general. How these and other books help to influence me is by giving the inspiration to create as much as I can freely. There aren’t limitations to what I can create or what ideas I can develop. As a person, I have the sense that I can turn anything into whatever I choose it to become. I’m not talking alchemy or anything wild, but if I want to achieve a goal, I can control the outcome based on what I do. Something so basic but these kinds of stories and ideas just drive that home further for me. I feel any success is attainable keeping this in mind no matter how big or small or where it’s found. Music. I love film and am a fan of soundtracks. When I hear a score or a song used in film, I always tend to think “man, I could have used it this way instead of that way and it would have been more effective”. I usually create scenes for the story I’m developing based on the song I’m currently listening to. I could hear something multiple times and things easily take shape. Something brand new may come as well that makes even more sense, so I move with that and progress as needed. But music is what triggers my thought process. It’s a great feeling. I want to give a sense that there are no rules when it comes to storytelling and how you present it. There surely needs to be structure and making sure what you’re saying makes sense, but you don’t have to conform to a certain flow just because Stephen King does it that way or it’s what’s expected in this kind of a genre. You are the storyteller. Tell your story your way. I also want to have a deeper connection with those who support the work. It’s so common to have people as fans of actors or musicians but find it difficult to connect with them, even with social media. I want to do my best to be one of the few who takes the time to acknowledge someone who appreciates my work or even outside of my work. I’m a huge fan of professional wrestling; so if we get into a discussion about wrestling, let’s have fun. We’re people, not only consumer and product provider. The dreaded review of my own work is just that. Even if I feel something is the best it can be I try to find a better way to present it next time. I don’t mind reading my own work for this reason. When the editor remembers he or she is not the storyteller here and the author remembers the editor is there to help. The editor is to clean up the vision of the author, not change it. As an author makes clear what they need and want, sticking with their plan, the editor can better assist in making the author and work shine. However, the author also needs to put their ego aside and listen to suggestions, especially if the author has a hard time editing. The author ultimately should have the final say in any adjustments made, but keep an open mind and things will be easier for both. A professional partnership for sure. Thank you for taking the time to read my story. Let’s share ideas. If I may give more than one, write as you see fit, but keep an open mind when it comes to help and suggestions. No publishing house can tell you how to write your story. Also, engage with your readers. If you’re on social media and someone retweets you, send a thank you. Something as simple as acknowledgement goes a long way and good reader/ writer rapport is essential to build on both a professional and personal level. Let’s connect more, you know? 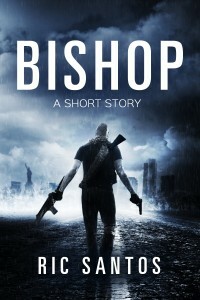 I’m currently running on the strength of BISHOP: A Short Story and Tranzport: A Flash Fiction. My next should be more full-length or at least long enough where it’s not considered a short story. Aside from wanting to present more full-length work, I look forward to the possibility of my writing opening doors to other forms of entertainment. Oh I leave that to the professionals. I’ve no programs or even patience at times to create a cover, but I do share ideas and examples of what I envision. I have no problem paying someone to get the job done for me. This also helps them have a few bucks in their pocket. Everyone wins. I don’t read as often as I would like nowadays. I do want to change that and genre isn’t something I really consider. My friend and I began having these discussions about quantum physics, string theory and alternate dimensions. I’m looking to start reading The Elegant Universe by Brian Greene so we can continue our other worldly chat, haha. Thank you for your time and cheers! 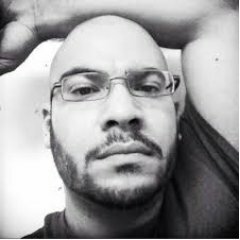 Please visit Ric Santos’ Independent Author Network page – Which also contains links to his Twitter page, Goodreads page and where to purchase his available writing.